Dangerous perp! Lock up your bananas! Subject was apprehended on his bed with said banana bunch located between the paws. Bananas had apparently been taken off the kitchen counter during the momentary absence of owner. Owner estimates that two out of four bananas were consumed by the perpetrator before discovery of the theft. A third banana has been disfigured and edible area is estimated to be reduced by half. The sole witness to the incident (Sunshine) has taken the 5th to avoid self-incrimination in the incident. Since breakfast had just been consumed by the perp, owner gave little weight to the “I’m Starving” defense initially offered by perp. After heavy interrogation, canine subject confessed to the incident and threw himself on the mercy of his papa. 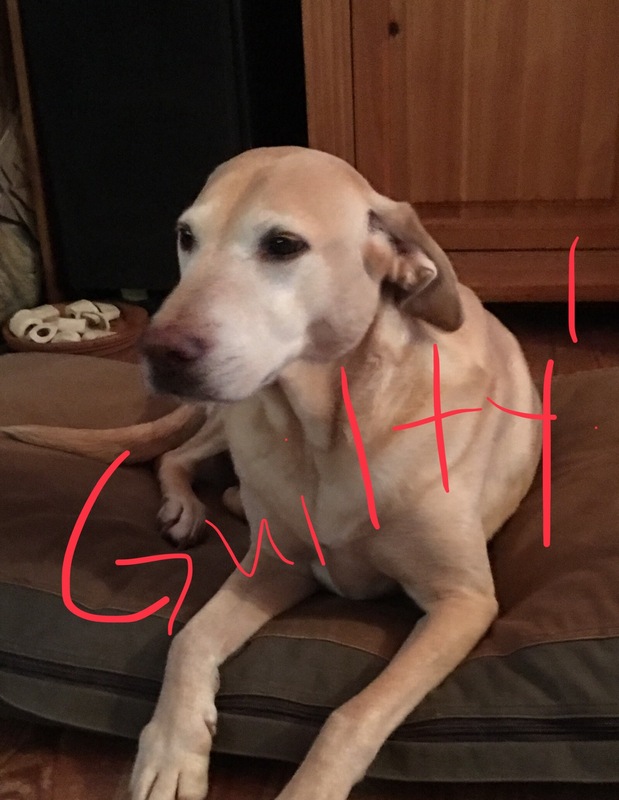 As this is not the first offense for this perp, leniency is not recommended. However, due to extenuating circumstances (a.k.a. he let papa rub his Fuzzy Ears) owner has elected to sentence the perp to probation without the possibility of belly rubs for a period not to exceed 10 minutes. Owner may reconsider punishment if additional circumstances arise in the form of yakking up banana parts or explosive pooping.